PM Dr. Timothy Harris greets CARICOM outgoing Chair and Prime Minister of Jamaica, the Most Honourable Andrew Holness. BASSETERRE, St. Kitts — Efforts to strengthen the advancement of the Caribbean Community (CARICOM) Single Market and Economy (CSME) will continue following recent developments that promote the free movement of people, goods, services and capital, and robust discussions slated for the (CARICOM) 30th Inter-Sessional Meeting of the Conference of Heads of Government of the Caribbean Community (CARICOM). The CSME is designed to deepen economic integration among member states of the Caribbean Community by creating a single economic space for the production of competitive goods and services among participating members. 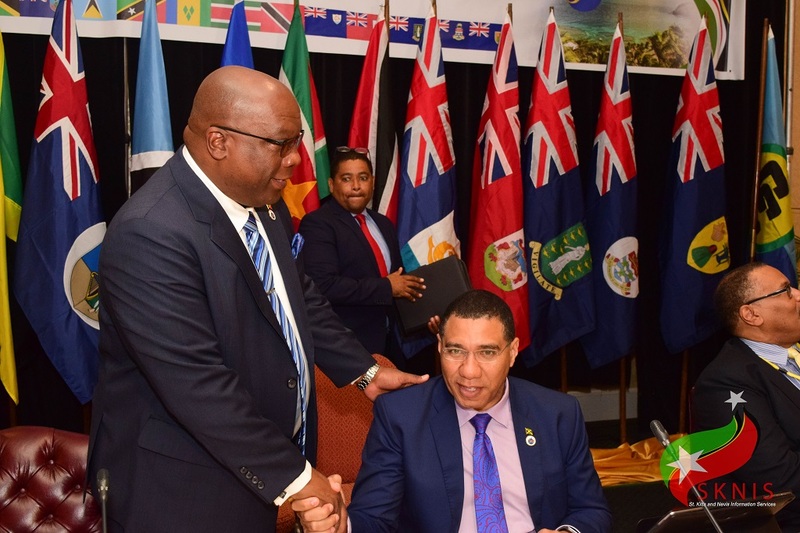 In December 2018, CARICOM Heads of Government expanded the category of skilled workers who can move freely to include agricultural workers, security guards, beauticians, and barbers. The development was one of several key outcomes from the 18th Special Meeting of Heads held in Trinidad on December 3 and 4, 2018. The focus was on the CSME and resulted in the St. Anne Declaration on CSME. Other outcomes included allowing a greater voice for private sector and labour; greater collaboration between CARICOM and the Organization of Eastern Caribbean States (OECS); public procurement and mutual recognition of member states’ incorporated companies; and recommitment to national action to further CSME implementation. Also in 2018, the establishment of the Protocol on Contingent Rights was finalized to allow dependents of persons with approved Skills Certificates to move freely with their loved ones and access to basic social services. During the two-day summit at the St. Kitts Marriott Resort, delegates seek to ratify decisions made from the meeting last December as well as consider other related matters.